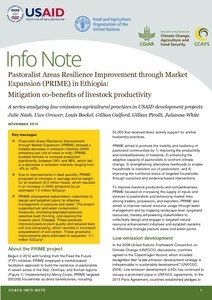 Pastoralist Areas Resilience Improvement through Market Expansion (PRIME) showed a notable decrease in emission intensity (GHG emissions per unit of meat or milk). PRIME enabled farmers to increase production significantly, between 24% and 96%, which led to a decrease in emission intensity ranging from -4% to -42%.  Due to improvements in feed quantity, PRIME projected an increase in average animal weight for all livestock (8.3 million head), which resulted in an increase in GHG emissions by an estimated 1.5 million tCO2e/yr.  PRIME empowered stakeholders collectively to design and establish plans for effective management of pastures and water. The project supported soil and water conservation measures, enclosing degraded pastures, selective bush thinning, and clearing the invasive plant Prosopis. These practices improved pasture plant quality and reduced bare soil and overgrazing, which resulted in increased sequestration of soil carbon. These grassland improvements were estimated to sequester -0.1 million tCO2e/yr. Nash J, Grewer U, Bockel L, Galford G, Pirolli G, White J. 2016. Pastoralist Areas Resilience Improvement through Market Expansion (PRIME) in Ethiopia: Mitigation co-benefits of livestock productivity. CCAFS Info Note. Copenhagen, Denmark: International Center for Tropical Agriculture (CIAT) and the Food and Agriculture Organization of the United Nations (FAO).